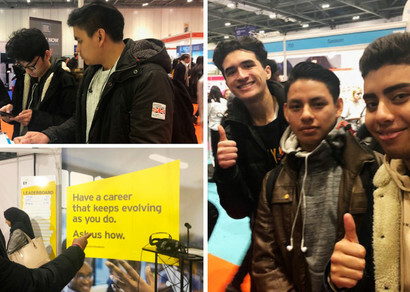 The IT department arranged for Year 12 and Year 13 students to visit the Skills London careers event at the Excel Exhibition Centre. This two-day event provides youngsters with the opportunity to discover careers through interactive, inspirational activities and demonstrations, and helps young people visually bridge the gap between what they enjoy doing and what they could potentially do as a career. This annual event attracts over 200 exhibitors. St Charles students made the most of the event and came away much clearer about their future ambitions and prospects!